This card is full of glitter although you can't see it very well. Each rose on the paper is glittered. I chose this paper for the Stamp Simply Friday challenge because we were to use glitter on our card. The base is 5.5x5.5 Neenah card stock and then each layer was decreased by 1/4 of an inch. I just received the new Renaissance Pendant dies from Spellbinders (the Borderabilities are arriving today so all will be shipped tomorrow). I used two of the dies the same size, scored the top one with my Scor-It and then folded it to give it dimension. A piece of the 1.5 silk ribbon was attached to the DP using my Glue Glider and wrapped underneath before attaching it to the white card stock. This gives a much cleaner look. I love the new Thinking of You Stamp Set from JustRite (feature on Monday's sale). I stamped The Thinking of You on matching plain DP, cut it out with the Oval Petite Nestie and then bordered it with the Scalloped Oval Nestie. I popped it up with some Dimensionals, attached the beautiful silk bow and it was done. By the way, be sure and take a look at the card Selma created with the Penny Black Blush Stamp and the new Lemonade Basic Grey Paper. It is beautiful!!!!! Totally Gorgeous! 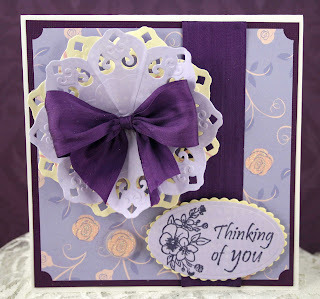 I LOVE the vintage, fan-like die cut you created -- WONDERFULLY DONE in beautiful colors!!! Beautiful!! The DP is very pretty and I love how you folded and layered the pendants. Absolutely LOVE that Gorgeous purple ribbon!! Just GORGEOUS Joan! Love your layout and of course the color ... uugh, my favorite you know!! Beautiful! You WORKED those new Spellbinders dies! A gorgeous card Joan, love your center pendant! Wow, that bow is fabulous, absolutely perfect for the design!